Home / Reports / Army Incursion in Al Ayn refugee camp, Nablus. Army Incursion in Al Ayn refugee camp, Nablus. 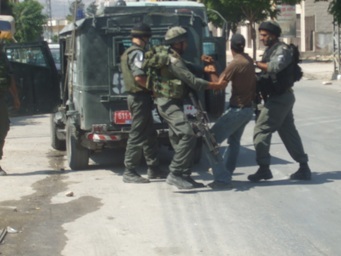 Israeli occupation forces (IOF) assaulted Al Ayn refugee camp in Nablus. The IOF attacked the camp and were met with fierce resistance from inside the camp. One soldier and one resistance fighter was killed. The camp was closed off and a curfew was put in place. A road block of earth was set up to stop people and vehicles from entering the camp. 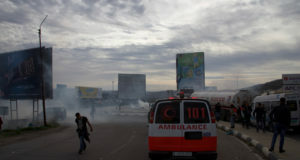 Ambulances gathered on Jamal Abdel Nasser street, the main entrance to the camp. They then dropped tear gas upwind of the ambulances, causing the crews to leave the area or seek shelter in their vehicles. An injured 17 year old was taken to the roadblock and put into an ambulance. The soldiers took the keys out of the ignition, forcing the ambulance to wait until an army medic had declared ‘whether he was dead or not’. The family of the gunshot victim were forcibly removed from the ambulance. Nervous soldiers were very aggressive with the press throughout. 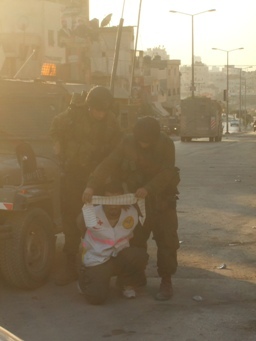 Palestinian Medical Relief worker is arrested and blindfolded for trying to access the wounded. Three medical workers were arrested during the invasion. An ISM Human Rights Worker (HRW) was filming an army jeep when the soldier in the back of the jeep attempted to throw a tear gas grenade at the HRW. He set it off in the back of his own jeep instead. Soldiers piled out of the jeep choking on their own tear gas. It seemed they threw a sound bomb at the HRW and ambulance crews who had witnessed the mistake out of embarrassment. Excessive repression was carried out all day against youths throwing rocks at army jeeps, humvees and bulldozers. 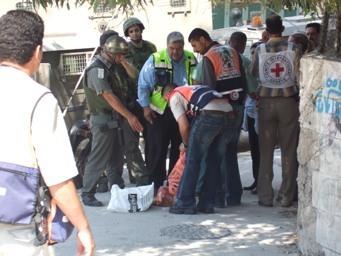 HRWs and Palestinian ambulance crews repeatedly tried to enter the camp. Urgently needed water, bread and medical supplies were not allowed in by the army. All negotiations with the IOF failed, both with the soldiers on the ground and the local DCO “humanitarian office”. 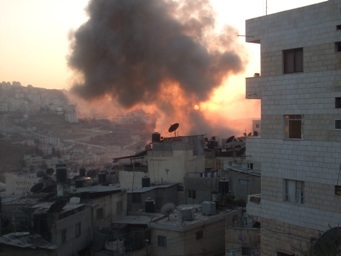 Smoke rises from Israeli army activity in the besieged camp. The lock down of Al Ayn refugee camp continued. After two nights of curfew and no medical teams entering, ambulance crews were anxious to get in and tend to the wounded. The IOF responded to the requests of the medics by firing rubber coated steel bullets at them. The ambulances were hit repeatedly, and after sustaining damage to windscreens and the vehicle bodies, were made to leave the area. At 10:20am ambulance crews and two ISM HRWs tried to gain access to the medical clinic but were forced back by concussion grenades and rubber coated steel bullets. At mid-day a large, colourful, non-violent protest march approached the camp. There were around 200 Palestinians waving flags and chanting songs. The army fired tear gas at the back of the procession, into a large group of women. They then fired tear gas and rubber bullets into the rest of the protesters. In the ensuing chaos people were hit by grenades and rubber bullets. The army fired indiscriminately into the crowd to create as much pain and havoc as possible. One HRW and an ambulance crew bravely broke the curfew. They ran past soldiers taking desperately needed medical supplies into the camp. They stayed for the rest of the evening giving out food and medicine to the trapped occupants of the camp. At around 6pm one ambulance with medicines supplied by an ISM HRW was allowed into the camp, bringing much needed relief to families trapped in the nightmare of the IOF invasion. During the curfew on this day, a 38 year old handicapped man in a wheelchair was shot while he was looking out his window. The situation continues with ambulance crews and HRWs on stand-by all through the night waiting for the next opportunity to gain access to the terrified inhabitants of the camp. Local Palestinians are arrested while demonstrating non-violently against the invasion. ISM HRWs came to the camp at 8:30am and saw the UN and the Red Cross among other NGOs on the scene for the first time. A couple of ambulances were allowed into the camp at 9:00am to bring much needed relief and aid to the camp inhabitants. At around 10:30am two people were arrested and taken from the mosque in handcuffs, into an armoured personnel carrier. One medic was arrested from the clinic on Jammal Abdel Nasser street. The IOF entered the clinic and checked everyone’s IDs. The medic was released late in the evening after being badly beaten with sticks during his incarceration. A peaceful demonstration was held in solidarity with the besieged camp. After speeches were made in the centre of Nablus the march began at 11:10am. There were colourful banners waved as the city’s people showed their support for the inhabitants on the streets for the second day running. As the marcher approached the camp, they were subjected to a hail of sound grenades and tear gas. The tear gas turned the crowd of peaceful demonstrators into a scene of fear and chaos. A building that was home to fifty children and their families is destroyed, they were given minutes notice. 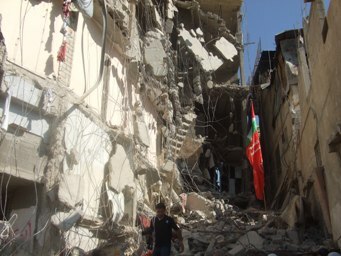 Along with a Palestinian medical crew three ISM HRWs gained access to the inside of the camp. 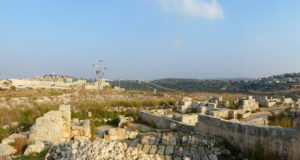 After sneaking over rough ground, the group stopped when faced with an IOF jeep standing in their way. The group gathered their courage and had the internationals in the front as they walked past the jeep. Around the corner were three or four more IOF vehicles forcing the medics and HRWs to dash down an alley and into the camp. Urgently needed medical supplies were distributed to the grateful residents in their homes. Danger was always wearing a uniform as the medics moved around the camp. HRWs led the way calling out ‘volunteer’ so any trigger-happy soldiers knew they were a medical crew. A student from Tulkarem had been trapped in the camp since Tuesday morning. One HRW gave her his high-visibility jacket so she could leave with the team and return home. 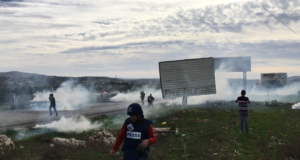 While exiting the camp the medics and activists were attacked by the IOF with sound bombs. All they wanted was to bring more supplies in to the needy people but were threatened with being shot by soldiers. At 5pm a building which housed around fifty children, recently visited by the medics and activists in the camp, was blown up by the IOF. This illegal act of collective punishment was because a cousin of one of the residents was wanted by the Israeli Army. Later in the evening the IOF set off a series of large explosions in the camp. The explosions lasted for around 20 minutes and many homes were destroyed. The city shuddered as the IOF continued its operations in Al Ayn refugee camp. Medical workers must go through extensive searches and ID checks while attempting to deliver food and medicine to the camp under curfew. After a three day siege of Al-Ain Refugee camp, IOF left the camp around 5am this morning. Residents were able to leave their homes for the first time since it began. At least two Palestinians were killed and an unknown number of people are injured. 49 residents of the camp were also arrested. Many homes in the camp showed signs of extensive damage. The IOF blew many doors off their hinges and bullets and tear gas canisters could be found on the ground in many places throughout the camp. At least one house, which had been the residence of fifty children, was completely destroyed by explosives. Several other houses had gaping holes in walls and showed signs of attempted demolition. Today, children sat in the rubble where their house once stood. International activists spoke with several residents of the camp, who described experiences of being without food, water and medicine. One woman spoke of being beaten by IOF soldiers outside of her home. A member of a Palestinian relief organization told activists that three medics had been arrested over the course of the invasion, with one still being held captive. The bodies of the two Palestinians killed during the invasion were carried through the streets by hundreds of mourners who remembered with rage the brutal treatment they have endured by the IOF. 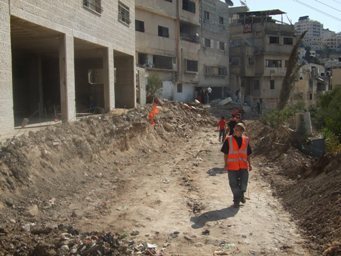 Palestinian and international HRWs walk along the destroyed route the Israeli army took through the camp.